Kate McMordie Stoughton was recognized as a Sustainability Superstar in the June issue of the DOE Sustainability SPOtlight newsletter. Break out the red carpet! 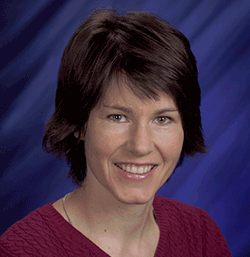 Kate McMordie Stoughton, a water efficiency engineer at PNNL, was recognized as a Sustainability Superstar in the June 2016 issue of DOE’s Sustainability Performance Office newsletter. McMordie Stoughton was recognized for her instrumental role in developing the DOE Strategic Water Management Plan. The plan analyzes water use across the agency to help prioritize water management initiatives and increase water security and sustainability for DOE. The plan also includes strategies to target best practices and alternative water projects. McMordie Stoughton specializes in federal water management, providing expertise to programs such as DOE Federal Energy Management Program, National Nuclear Security Administration, the Army, and the General Services Administration. She is a Certified Water Efficiency Professional, a member of the American Water Works Association, and has a degree in Civil Engineering from the University of Colorado.